Worth ASA Super Green Dot Slowpitch Softball YS11RSA3. 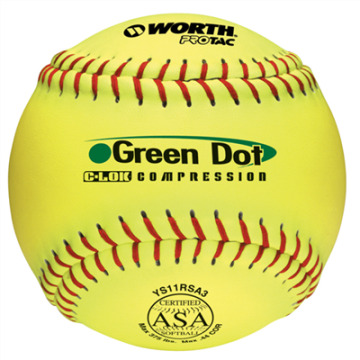 Worth's 11" slow pitch softballs have red stitching and are approved for play in the ASA. These Worth's Green Dot softballs feature a 3-piece technology that has an inner layer that gives this softball consistent spin and durability, while also adding in C-LOK plus and ProTac synthetic leather cover.